A short-lived, leafy herb with high feed value, chicory can be incorporated into a rotational grazing system through its active growing months. Chicory has a good summer yield but limited cool season growth. A summer active herb, chicory provides high yields of palatable feed from spring through to autumn and has a deep tap root which supports growth through dry conditions. 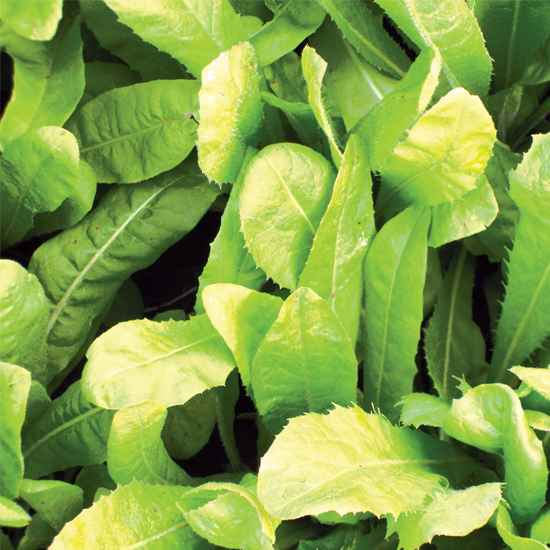 Chicory is a popular summer feed option in the Upper North Island, but is rarely used as an 18-month option because of poor winter and early spring growth. There are two ways to grow chicory: in a pasture mix, or as a special purpose crop. Chicory will last 1-2 years under dairy grazing. Choice chicory is a cultivar type. We refer to 'Choice chicory' because our information is based on New Zealand trials and experiences using this cultivar. Other chicory cultivars may require different management. Talk to local seed representatives for cultivar options. Chicory cultivars also vary in their ability to persist. How long will chicory last? Chicory commonly lasts 1-2 years under dairy cow grazing. Chicory does not persist indefinitely due to fungal root diseases slowly increasing in the soil and, if in a mixed pasture, potentially repeated selective grazing. In northern regions under dairy grazing farmers should expect no more than two productive summers with greatest production in the first year. Spring-sown chicory stays leafy in the first summer and does not go to seed. If taken into a second summer chicory goes to seed (after winter vernalisation) which reduces feed quality. What do you mean by special purpose crop? Grown as a single species (or with clover) and managed as crop. Alternatively, chicory can be sown in a mixture with grasses, legumes, and other herbs. Where chicory is in a pasture mix the paddock should be managed as it would be as normal grass/clover pasture, grazing to residuals of 1500-1600kg DM/ha. How to take chicory crop through a second summer? Autumn - The decision to take chicory through a second year should be made in autumn. At least 30 plants/m2 are required to achieve a yield of 10-12t DM/ha in the second year. Avoid overgrazing and treading damage in the autumn to maintain plant populations and tap root size. Winter - Chicory is semi-dormant in the winter (June-August) and should not be grazed through this period. Grazing reduces the size of the root and can damage plant crowns which creates entry sites for fungi, reducing the survival of chicory plants. Second-year grazing - In its second-year chicory will go to seed. Careful management is required to minimise the number of plants that have mature reproductive stems. Grazing cows avoid mature stem, reducing the utilisation of DM grown. Chicory produces 8 -16t DM/ha/year of quality forage from September to May. It is a multi-graze crop that can be easily incorporated into rotational grazing during its active growing months. The yield depends on many factors including summer rainfall. Average growth rates in spring are 35-70kg DM/ha/day, increasing to 60-70kg DM/ha/day in summer. Average autumn growth rates are 20-45kg DM/ha/day. In winter chicory is semi-dormant and should not be grazed. Well-managed chicory (0-20% stem) has a lower dry matter content than ryegrass-based pasture and generally contains less fibre. The metabolisable energy (ME) content is similar. Yet, chicory may be better quality than ryegrass during hot, dry summers. Therefore, milksolids response to chicory appears to depend on the quality of the pasture diet: if pasture quality consistently drops away in summer, then including chicory can increase per cow milksolid production. Chicory has high digestibility and low fibre content and isn’t suitable as a sole diet for cows. Chicory should be first grazed no earlier than the seven-leaf stage, i.e. plants have seven fully grown leaves. This is normally eight weeks after spring-sowing. This ensures plants have well-developed tap roots to improve survival through the growing season. Aim to feed about 20% of the cow's daily diet (3-4kg DM/cow) in chicory over a sustained period as the rumen requires time to adjust to chicory like any change in feed type. What are the target covers for best performance? Target cover heights are measured by leaf height ignoring the stems. - Target pre-grazing height of first year chicory is 25-35cm (generally. first-year chicory will take 3-4 weeks to reach this height depending on the time of year and weather). - Target post-grazing height is 5-10cm. Dairy cows will readily graze lower than 5cm and management strategies need to be in place to ensure this does not occur. * Times may change depending on temperature and soil moisture in your region, i.e. slower growth when temperatures are cool or if there is low soil moisture. To minimise the amount of mature reproductive stems, the pre-grazing height of the leaves should not exceed 25cm in the second year. Letting the leaves grow beyond 25cm will not accumulate any more leaf, just increase stem growth. In the second year, it is difficult to achieve target residual heights due to stem. As residuals have less impact on yield and persistence than grazing interval, the main concern should be achieving target pre-grazing heights. How can I use the 35cm height to allocate the right area? As a rough guide, a dense (approximately 140 plants/m2) first year pure chicory crop at DairyNZ Waikato had a pre-grazing mass of 2700kg DM/ha, while a less dense crop (approximately 55 plants/m2) had a pre-grazing mass of 2000kg DM/ha (both at the same 25cm height). If we assume, on average, the pre-grazing mass of a chicory at 35cm high is 3200kg DM/ha, the herbage available to cows is approximately 1900kg DM/ha (above a post-grazing residual of 5cm). - Cows will likely reach 5cm in 2-3 hours. If the cows reach this residual a lot quicker than this, then it is likely that they are not eating 3kg DM/cow. - While DM yield can differ greatly on plant density, dry matter can also impact yield estimates; yield estimates can vary by up to 50% if DM is over- or under-estimated. Checking post-grazing residuals is important. Like pasture, the rising plate meter can be used to estimate the yield of first year chicory crops, when there is no stem present. Take at least 40-50 readings in a ‘W’ shape across the paddock and calculate yield using the equation: Yield (kg DM/ha) = RPM height (clicks) x 86 + 235. This equation is affected by many factors so it's important to check post-grazing residuals as explained above to ensure adequate herbage allocation. To achieve a daily diet of approximately 3kg DM/cow of chicory during the summer/early autumn (20% of diet), the amount of chicory planted would need to be about 3.5ha per 100 cows. The daily allocation would be about 0.17ha per 100 cows and would take 2-3 hours to graze. Back-fencing is needed avoid grazing regrowth. This system provides for a 21-day grazing rotation, which is about how long it takes to grow to 25-35cm. 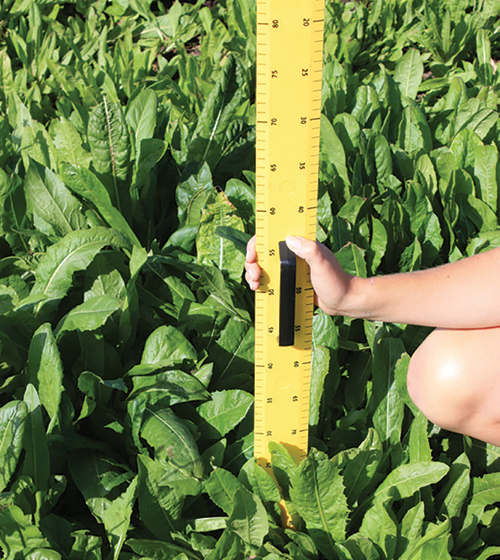 The rotation length may need to be adjusted if growth of chicory is unusually slow or fast. Chicory can be grown as a special purpose crop or as a pasture mix with grass/clover. Chicory as a special-purpose crop can be used to fill summer feed deficits and provides an opportunity to break weed and insect cycles, e.g. black beetle, clover root weevil; before pasture renewal. The recommended seed mix for a crop is 4-6kg/ha chicory and 3kg/ha clover or 4-8kg/ha chicory if sown without clover. Chicory can be added to a pasture/clover mix at 1-4kg/ha or oversown into new pasture before grazing in the spring. Oversowing in spring suits pastures sown in the autumn that require thistle spraying in their first winter. Due to the highly palatable nature of chicory it will likely be preferentially grazed, reducing its persistence. Chicory establishes best when sown into warm soils (12°C) at less than 10mm depth. Spring sowing is preferred as plants develop quickly and reproductive stems won’t grow until the following spring. Planning is important as sowing chicory too early means young plants may be damaged by frost while sowing too late runs the risk of dry conditions reducing plant establishment and survival. Sowing after cultivation using a roller drill is recommended. Pre-emergence insecticide and treated seed are also recommended. Chicory can be successfully established by direct drilling following herbicide application, however, careful attention is required to ensure sowing depth is no greater than 10mm and slug bait should be used. While broadcasting seed is the simplest and cheapest technique, it reduces chicory plant establishment, increasing weed invasion, and reducing yield. The increased cost of direct drilling compared with broadcasting is more than compensated for by the increased yield. Chicory should be first grazed no earlier than the seven-leaf stage, i.e. when plants have seven fully grown leaves. This is normally eight weeks after spring-sowing and ensures plants have well-developed tap roots to improve survival through the growing season. Chicory grows on a range of soil types. However, silt loams with good summer water-holding capacity - that aren’t prone to waterlogging - are best. Heavy clays and poorly drained soils are not recommended because treading damage and fungal disease affects the crown and root reducing persistence. Chicory can tolerate acidic soils, however, the optimal pH is 5.6 to 6.2. Soil fertility requirements are as for ryegrass/clover pastures. Nitrogen fertiliser, e.g. 35kg N/ha, improves chicory establishment. Compound fertilisers such as DAP also improve establishment, especially when direct drilling. Chicory has high tolerance to insect pests and provides dairy farmers with an alternative to summer turnips in areas where insect damage is a problem. Weeds should be thoroughly eliminated before sowing as there are few suitable post-establishment herbicides for chicory. Certain weeds can be controlled in the early stages of establishment with flumetsulam-based herbicides at recommended rates. Withholding periods for residual hormone herbicides, e.g. clopyralid, aminopyralid, dicamba, must be adhered to as chicory is very sensitive to these herbicides. Characteristics of Choice chicory and Tonic plantain - chicory or plantain? Ryegrass growth can be seriously limited in areas prone to summer dry conditions without irrigation. Are there other forage species that could be integrated into farming systems to fill the summer feed gap? The Chicory and Plantain programme of work aimed to determine milk production responses to supplementing a pasture-based diet with chicory or plantain in summer, and how grazing management affected the growth and quality of these herbs, as well as their persistence.